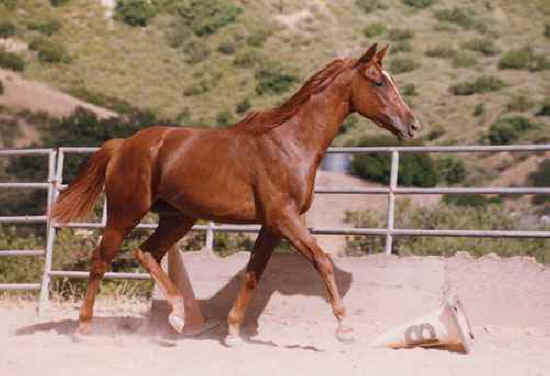 One of The Animals Voice's first rescues was of a two-year-old Thoroughbred colt, Alabama Blaze, who'd been cast to the slaughterhouse because he'd only won a few thousand dollars at the racetrack. 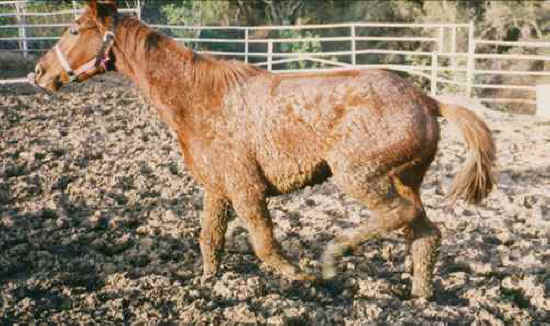 The kill pen to which he'd been doomed soon became liquefied mud, urine, and manure — and the ammonia was so strong, "Bama," as he was later called, developed third-degree burns on all four of his legs. He was in such pain and so swollen with fever that he was barely able to walk and could not compete with other horses in the pen. That meant he couldn't get to the hay feeders nor the water troughs. After nearly two weeks in the kill pen, The Animals Voice rescued him. Bama is removed from the mud; he nearly fell down several times. While hosing off his coat (and while he desperately drank from a bucket), his skin came off, too, revealing the burns on his legs. Two months to the day of his rescue, Bama fully recovered and — with a shining coat and a positive mind — he flaunted his full recovery. He was later adopted by the founder of the Compassion for Animals Foundation (in whose care he lives to this day). 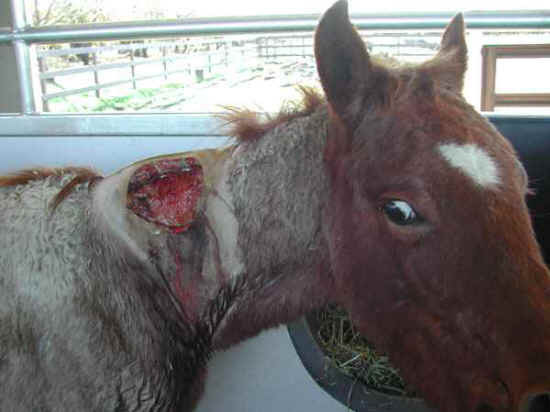 Lancer was six months old when an unknown trucker pulled onto the sanctuary and unloaded this severely wounded young horse. The "story" was that the little guy had been attacked by a stallion from a neighboring pen, an injury so grave, our vet had to remove chunks of his flesh to excise the infection. At certain angles, you could literally see through Lancer's neck. With round-the-clock wound care, Lancer eventually healed. His mane grew back, too. 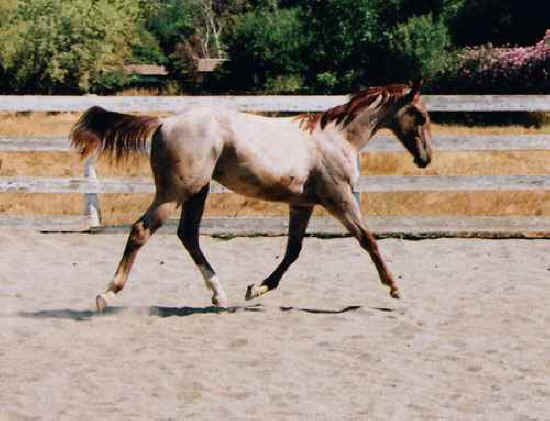 Lancer enjoys a trot across an arena. He's actually on his way to greet Stefani, his newly adopted caretaker. She still calls him the love of her life. Margaret arrived at our sanctuary with a load of other mares who were part of her herd. They were all suffering from extreme starvation and thirst — part of a ranch that had been liquidated and the horses abandoned to a slow, painful fate. Margaret eats her first meal in weeks; her skeleton is visible under her hide. She and the other members of her herd were slowly nursed back to health. Margaret, like her companions, continued to put on weight — until one day, Laura began to think maybe she was overweight ... and not because she'd now had too much to eat! 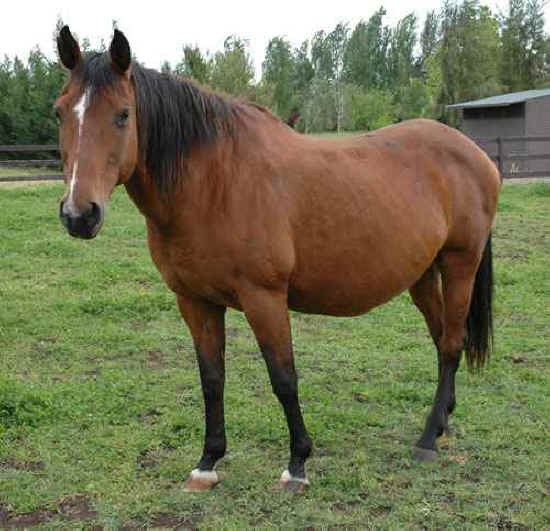 Sure enough, after a vet visit, it was discovered that Margaret, and the mares in her herd, were pregnant. 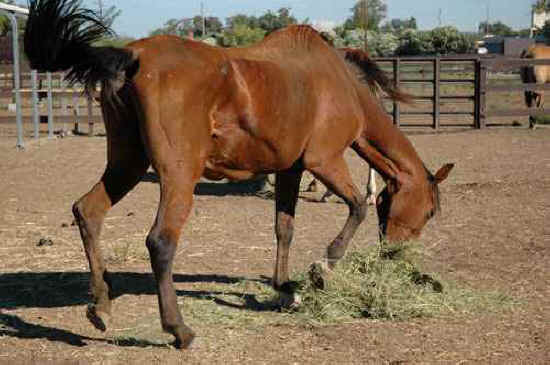 Margaret just a week before she gave birth to Misha, a young filly who still lives at our sanctuary. Margaret was adopted by a close friend of The Animals Voice where she lives in the same peaceful environment as she'd grown accustomed to at The Animals Voice Horse Sanctuary. We are in desperate need of funds to repair fences, acquire fly masks and other fly protection products for the upcoming summer, as well as, of course for that endless stream of hay and veterinary help. We really must get ahead of our recent slide and your donation can get us back on top and out in front!